the PBO Project Boat Hantu Biru (PBO July 2013), we paid a visit to Sika’s headquarters in Welwyn Garden City, where Sika’s Gareth Ross showed us his tricks and tips for getting the best from sealants. 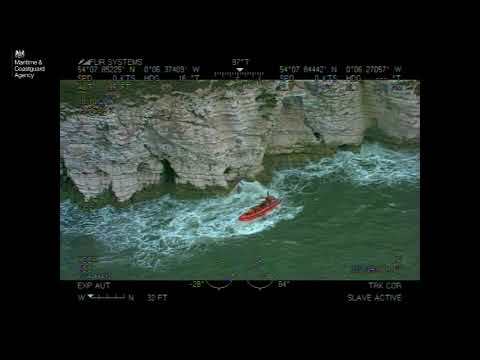 He was dressed in a shirt and trousers, but stayed amazingly sealant-free: proof that you don’t have to end up wearing more of the stuff than the boat. 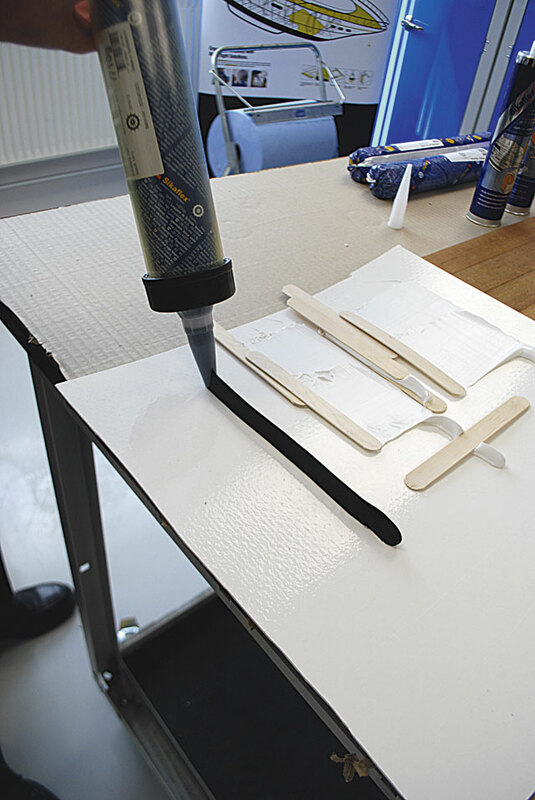 Here are Gareth’s tips for using sealant. Primers help sealants adhere to the chosen surface. 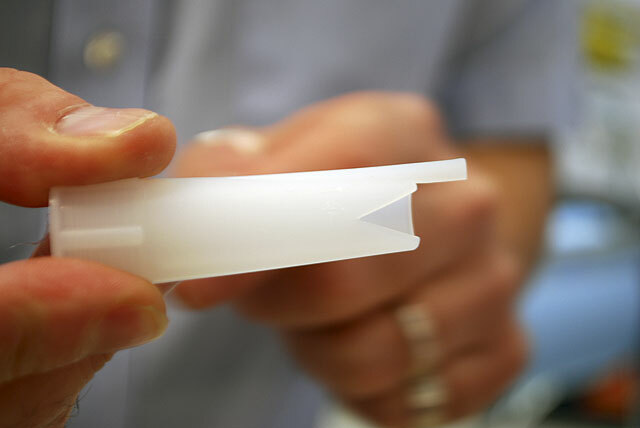 They have a short shelf life, but improve adhesion by around 20%. 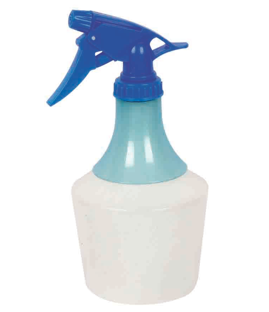 Some solvent-based primers can be applied by cloth, but most should be brushed on. 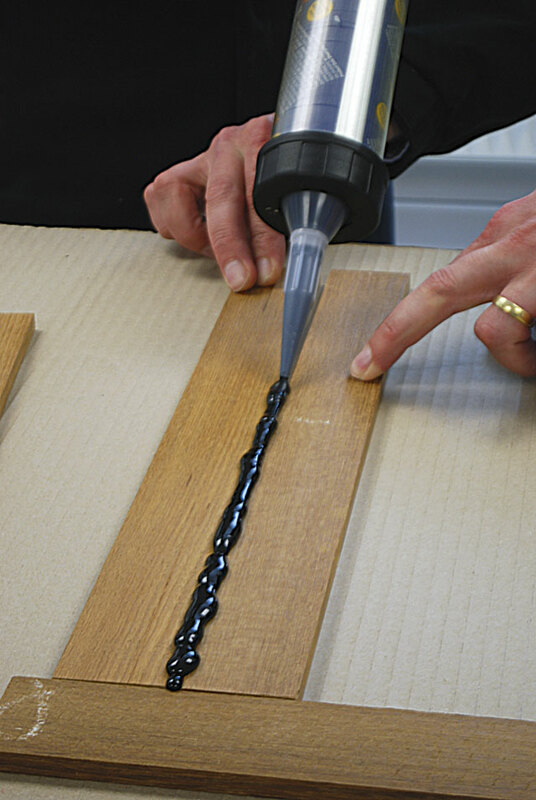 By and large, if you are looking to bond something on, it’s best to use a triangular bead of sealant. This ensures the minimum amount of wastage, and an even bead when it’s all tightened up. To get a triangular bead, cut a notch in one side of a nozzle and apply it with the gun perpendicular to the surface. 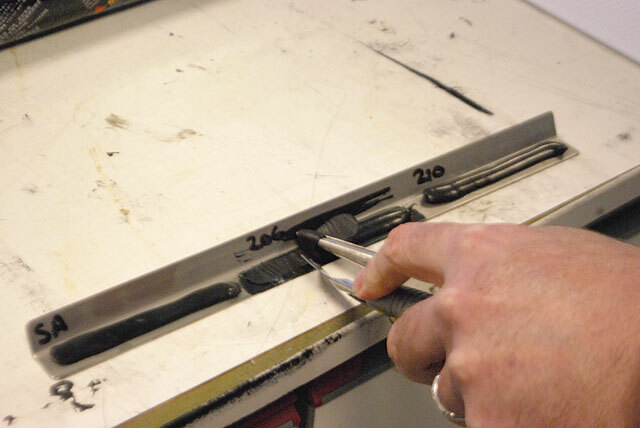 You can also cut in a guide to keep the nozzle a set distance from the edge of the material being bonded. Most sealants cure at the rate of 2-3mm per 24 hours, which is why it won’t last forever in its tube. It is moisture-cured, which means that in hot and humid conditions it’ll go off even more quickly. Keeping it in the fridge will slow the rate of cure somewhat. 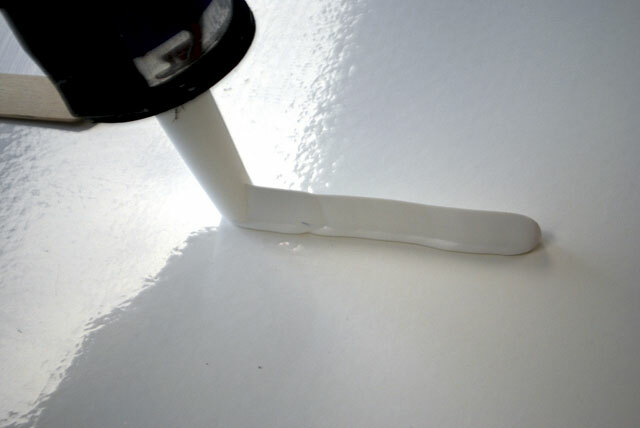 Always keep the nozzle attached: the sealant in it will cure slowly but can often be pulled out to reveal fresh sealant at the start of the tube. For obvious reasons, don’t open a tube until you’re ready to use it. 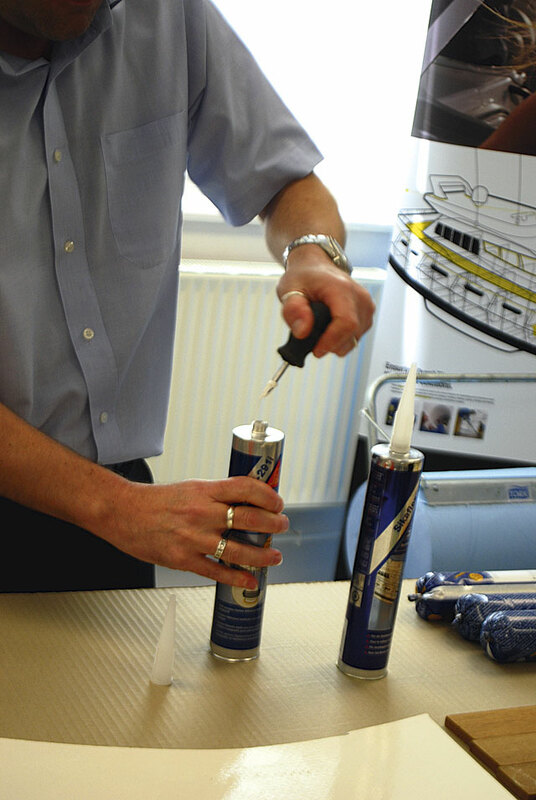 Sealant manufacturers are often asked if there is a miracle chemical that will remove their sealant: the short answer is usually ‘No!’ The only way to remove cured and well-adhered adhesive sealant is with mechanical methods – ie a sharp knife, vibra-saw, cheese wire – or abrading it off with a sander. Here Gareth is removing Sikaflex from a window frame by gripping it with needle-nosed pliers and cutting it away with a scalpel. When sealing deck fittings, screw or bolt them down almost tight then wait for the sealant to cure before giving the fixings a final tighten to compress the sealant and bed them down as securely as possible. As already mentioned, polyurethane sealants are moisture-cured. You may find when bonding large swathes of a teak deck to glassfibre or steel that the sealant may struggle to find enough moisture to begin curing. To give it a helping hand use a spray bottle to spray a very fine mist over the laid deck to kick-start the curing process. There are two main ways to caulk the seams of a teak or other wooden deck. One is to overfill the seams between the planks, leaving the sealant to stand proud until it has cured. 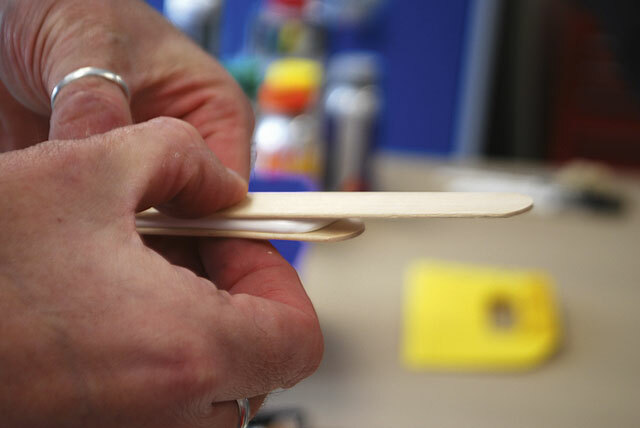 You can then cut away the excess with careful use of a sharp chisel, followed up by sanding. The second option is much more labour-intensive, but results in less wastage of sealant and less sanding overall. 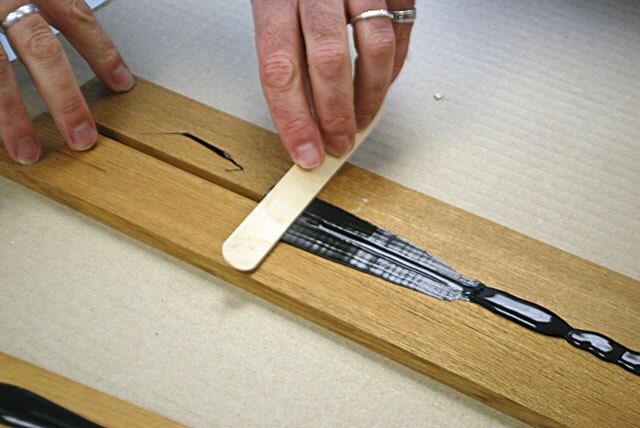 You’ll need to mask off each joint so that the surrounding teak is covered, before applying the sealant. Smooth the sealant off with a scraper before it cures, being careful not to smooth away so much that it leaves a hollow, then carefully peel off the masking tape, also before the sealant fully cures. Peeling the tape is messy, but there’s much less sanding to do afterwards and no risk of accidently chiselling gouges in your lovely new deck. 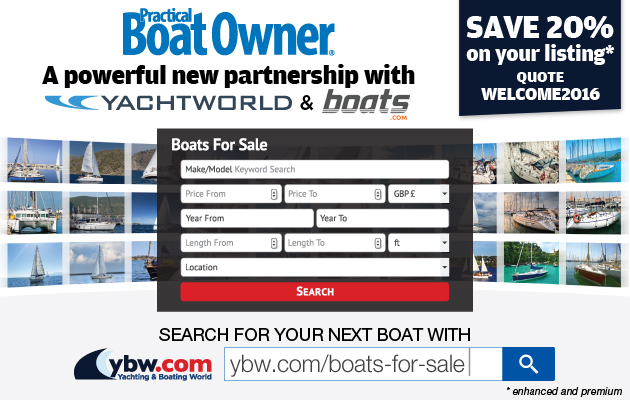 Some boatyards claim the first option is best. They won’t remove the raised sealant until near the end of the job – walking on the raised surface is a great way to protect the teak during work. 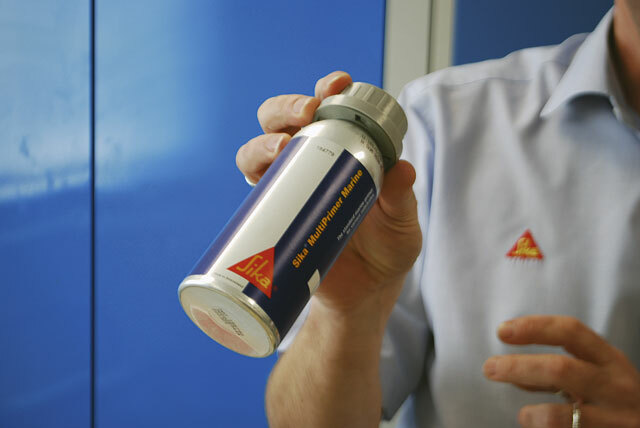 Bedding compounds such as Sika 298 are surprisingly quick and easy to apply. 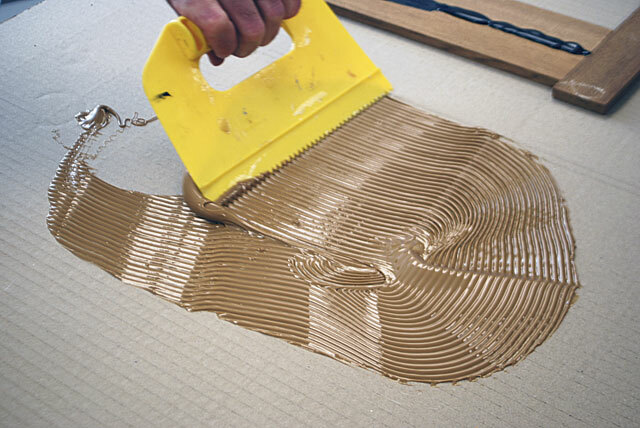 Simply snip off the end off the ‘sausage’ before squeezing the gloop onto the deck and spreading it out with a notched spreader to ensure an even layer of sealant. 9. Get a good gun! If you’ve got a lot of sealant to apply, it’s well worth getting a good-quality ratchet or electric-driven gun. 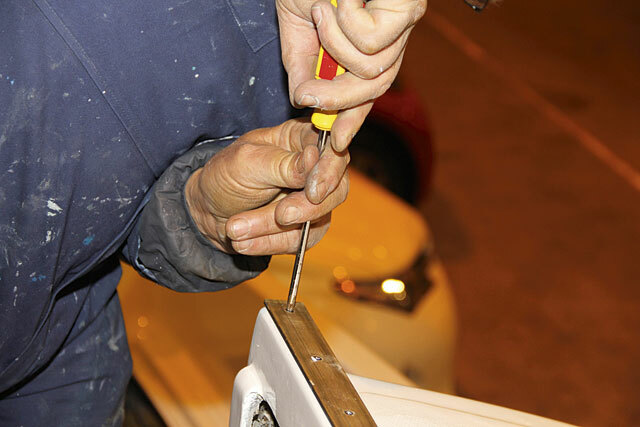 Your hand muscles will start to hurt surprisingly quickly with a cheap gun – especially with window adhesives which can be stubborn to squeeze out of their tube.